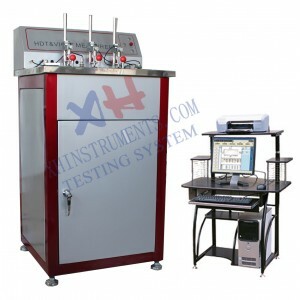 The XHS-15 thermal deformation, Vicat softening point temperature tester is mainly used for the determination of temperature of thermal deformation and Vicat softening point to nonmetallic materials(such as plastic, rubber, nylon, electric insulating materials, etc. 1. Computer collects temperature fluctuation and controls overall process, real time displays temperature, deformation curve, CRT color curve display, prints the test result automatically. 2. The software adopts menu operation and crypto guard, which makes operation of users more practical. 3. Digital process, computer and meter display real-time temperature at the same time, which makes the system more reliable. 5. Excel report forms can be automatically compiled and meet with the require ments of customer.